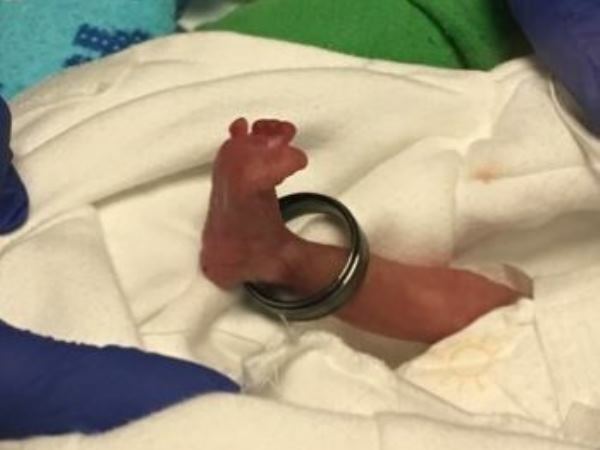 Little Rayden was so tiny when he was born that his dad’s wedding band could easily fit around his ankle. He was so tiny when he was born just more than a month ago that his dad’s wedding band could easily fit around his ankle. Doctors were forced to deliver little Rayden Mondragon, from Othello, Washington, in America, with a Caesarean after they discovered he wasn’t getting enough oxygen when his mom, Marissa, went for a routine check for Down syndrome at 20 weeks. At birth Rayden’s development was that of a 21-week-old foetus. He weighed only 390 g and measured just 26 cm. Marissa and her husband, Robert, were excited when they heard their six-year-old, Robert Jnr, would be getting a little brother in January next year, they write on their page on a support website. But tests showed the baby was abnormally small and wasn’t getting enough oxygen and nutrients through his placenta. At first doctors gave Marissa injections to stimulate his lungs but two weeks later they decided drastic measures were called for or the baby would die in the womb. When the boy was rushed to a neonatal intensive care unit his parent started praying. Not only were his lungs badly underdeveloped, there were also problems with his digestive system. Fortunately scans to check for bleeding revealed the boy’s brain wasn’t affected. It’s still too early to say with any certainty what the future holds for Rayden but his family are hopeful.